Situated between the Swartberg in the north and the Outeniqua and Langeberg mountains in the south is a plain which is about 60 kilometres wide north to south and 250 kilometres long from west to east. This dry and arid area is called the Little Karoo. Its mountains are full of deep ravines which are choked with vegetation and teem with wildlife. On the western edge of the plain is a fertile valley lying between the coastal belt and the Karoo which is enclosed by the Langeberg and Swartberg mountain ranges. The valley has a higher rainfall than the Karoo and it was this feature which attracted early permanent populations of Quena people to the low lying floor of the valley and the Bushmen / Khoisan people to the mountains. The Quena had a path through the Langeberg, which followed the deep, and steep, ravine known as the Tradouw Poort. It was this pathway that gave rise to the Tradouw Pass of today. 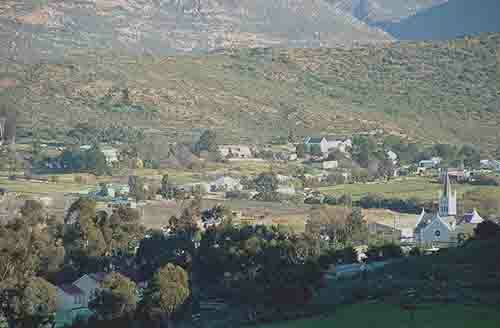 The town of Barrydale named after James Barry, is situated at the northern opening of the Tradouw's pass which winds its way through the mountains to Swellendam. Barrydale's history begins in the early 1700's when farmers moved into the area looking for fertile lands with water to farm. They settled in the valley and after a while decided that they needed their own church and chose a spot where today the R62 and R324 roads meet. In those days before the church was built there were a number of nagmaal houses (Houses where Holy Communion could be celebrated) and a school and not much else in the village. The Dutch Reformed Community of Barrydale came into being in 1878 when land was purchased to build the church. Over the years the village grew and eventually in 1921 a Municipality was established. As the farmers in the area were encouraged to plant vineyards and orchards it was natural that a winery and distillery would eventually be built. In 1940 the Barrydale Koöperative Wynkelder was formed and a distillery established giving rise to the wine industry in the area. Barrydale because of its situation at the gateway to the Little Karoo attracts tours leaving Cape Town for Mossel Bay and the Garden route. As many visitors want to include Oudtshoorn and the Cango Caves in their itineraries the route through Barrydale is ideal as it gives them a good idea of the differences that a mountain range 30 kilometres wide can make in the vegetation of our country. In Spring the route becomes even more scenic when the wild flowers bloom and turn a dry and arid land into a carpet of colour. The vegetation on either side of the Langeberg is very interesting. The northern side contains succulent type vegetation such as the Aloe striata; botterboom, Tylecodon paniculatus while on the southern slopes there is fynbos vegetation which consists of proteas and ericas and reeds. As one moves further into the Little Karoo the climate becomes more arid and large quartzite patches are found where smaller compact succulents grow. The succulents growing here depend on the reflecting properties of the quartz to keep the soil cool. 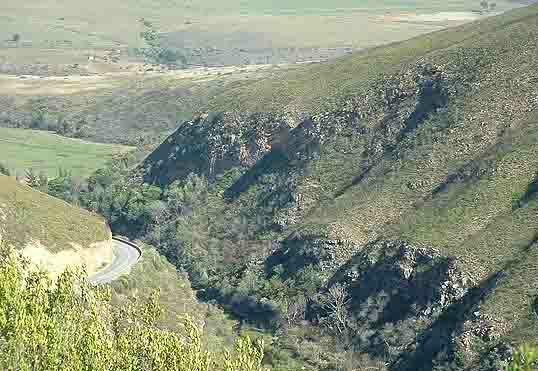 The R62 highway that one travels along from Barrydale towards Oudtshoorn is very interesting as one gets to drive through some awesome mountain passes with rivers flowing far below the roadway. The difference in day temperatures from the coastal region to the Little Karoo are marked. Visitors to the area often leave Swellendam in rainy and cold conditions and thirty kilometres later find themselves in hot summer conditions . South Africa is a land of contrasts and the Barrydale area is one of the places where the contrasts are visible. Next time you visit the Garden Route take a drive over the Tradouw Pass and experience the charm of the area. Barrydale would love to welcome you.